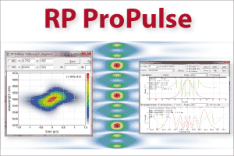 With the RP Fiber Power software, one can investigate various kinds of pulse distortions, e.g. 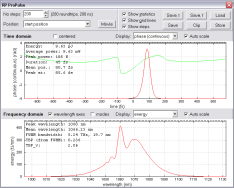 resulting from gain saturation, chromatic dispersion, the Kerr effect or stimulated Raman scattering. For propagation in homogeneous media (e.g. bulk crystals), the spatial properties can be affected. An example is self-focusing, which can in extreme cases lead into laser-induced breakdown. In less extreme cases, one still has the effect of an aberrative and time-dependent lens. Strong spectral distortions can result from, e.g., self-phase modulation: the optical spectrum can acquire strong modulations and broadening. The temporal shape of a pulse can also be distorted: the pulse may be broadened, may become asymmetric, and or acquire temporal pedestals. In extreme cases, a pulse can break up into multiple pulses. An example is higher-order soliton fission in the process of supercontinuum generation. A related phenomenon is wave breaking. In many cases, the temporal distortion is not the direct impact of a nonlinearity, but rather the consequence of chromatic dispersion acting on a pulse with nonlinearly broadened optical spectrum. For example, self-phase modulation (in an approximation not containing the effect of self-steepening) or Raman scattering do not directly affect the temporal shape, but modify the optical spectrum so as to make a pulse significantly more susceptible to the effects of chromatic dispersion. In amplifiers, the effect of gain saturation can also lead to substantial distortions of the temporal pulse shape: while the leading wing of the pulse experiences strong amplification, later parts are less strongly amplified as the gain is saturated already. 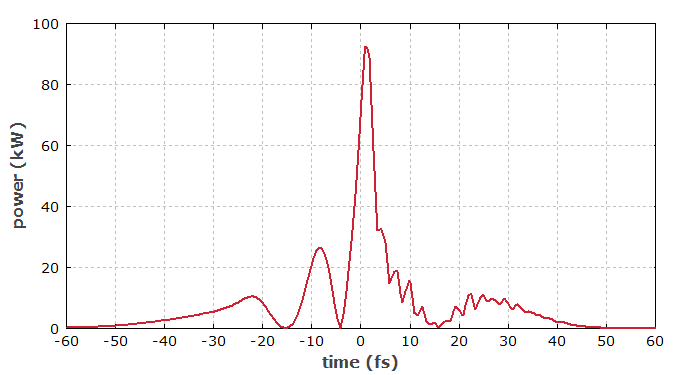 Figure 1: Temporal shape of a femtosecond pulse, which has been distorted during propagation in an optical fiber. The nature of nonlinear pulse distortions depends strongly on the circumstances, i.e., the type and strength of nonlinearity and on the occurrence of other effects such as chromatic dispersion or waveguiding. It can be investigated with pulse propagation modeling. There are various methods to mitigate nonlinear pulse distortions, e.g. in amplifiers for ultrashort pulses. Examples are the use of thin (and highly doped) amplifier crystals, chirped-pulse amplification and divided-pulse amplification.